The global packaging market amounted to USD812 billion in 2014 registering a CAGR of 4.2%since 2010. Estimated at USD839 billion in 2015, it is set to reach USD998 billion in 2020 with AAGR of 5% and to reach USD1,100 billion in 2024. With a global population of 7.35 billion human beings in 2015 according to the UN, each individual consumes USD114 of packaging per year in the world. This is a mathematical average which masks many disparities! The most developed economies are the highest users and producers of packaging. These mature markets are undergoing major changes in the packaging chain of value, driven by demographic and environmental changes and the "new economy". Emerging economies are creating new opportunities, thus satisfying the expectations of their populations. 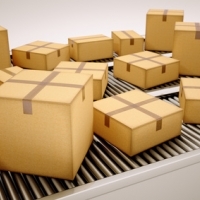 Amongst the most dynamic, the packaging market of the Middle East and North Africa (MENA) is forecast to grow from USD35.4 billion in 2014 to USD45.2 billion in 2019, with a CAGR of 5%, which is higher than the global packaging market. The global packaging market is divided into five main categories of materials: plastics, paper and board, glass, metal and wood (textile is marginal). For many years, this market has been seeing growth in the use of rigid plastic materials and flexible materials. In terms of packaging units, the main packaging materials used in the world are also flexible materials (36%), paper and board (24%) and rigid plastic materials (20%). The most used types of packaging are bags and sachets (875.59 billion units), bottles (810.32 billion) and cans (412.95 billion). 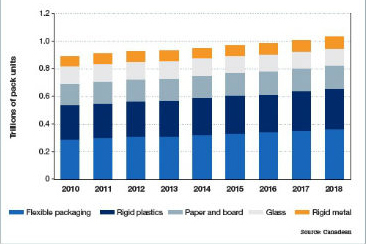 Rigid plastic packaging should continue its growth according to a CARG of 4.4% until 2020 to USD222.5 billion. PET remains the leader thanks to its light weight, which reduces costs and carbon footprint during transport. Its global consumption is set to reach 21.1 million tonnes in 2021 thanks to technological developments, such as packaging for milk and the ability to fill hot sauces and cooking preparations. Africa, the Middle East and Asia will be the largest consumers of rigid plastic packaging in the next five years. Inversely, on markets like Australia, demand for carbonated drinks, water and food products seems to be saturated and is moving towards soft plastic packaging as new growth sources. The demand for flexible packaging (paper, plastic, complex/multi-layer materials) has greatly developed in the last decade, to reach USD210 billion in 2015. Technological leaps and the macro-environment have transformed this packaging, initially perceived as low-cost, into a must-have in terms of quality for a multitude of applications. This market is forecast to grow at an annual average rate of 3.4% over the next five years, to reach USD248 billion by 2020. Asia is forecast to remain the biggest market, progressing from 42% of market share in 2015 to nearly 45% in 2020, ahead of Eastern Europe. Food is the leading sector with 70% of flexible packaging amounting to 18.8 million tonnes in 2015. Thanks to improved barrier properties of thin flexible materials, the future of this type of packaging is promising. Likewise, high-speed filling equipment which holds packaging by the neck is encouraging the penetration of flexible packaging on the beverages market. Paper and board packaging (folding, corrugated board or cardboard for liquids) holds onto its leadership position in global consumption, amounting to USD261 billion in 2015. It is forecast to retain this position in 2020 with a CARG of 3.5%. In 2015, China was the biggest market, ahead of the USA, and will represent nearly a quarter of global consumption in 2020. India and South Korea are forecast to record high growth. The expansion of on-line commerce is beneficial to board packaging in countries where this material dominates, such as in China where Alibaba ships 12 million parcels per day, and in India. And board packaging is changing because over 30% of on-line purchases are returned – hence the necessity for packaging that is easy to open and to reseal – and because e-commerce places emphasis on packaging to maximise the customer experience. 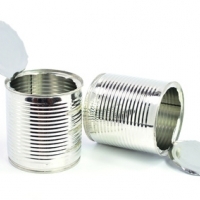 Metal packaging follows the trends of the global packaging market. Estimated at USD102.9 billion in 2015, the global market is forecast to reach USD106.1 billion in 2016 (+3.1%) and USD132.1 billion in 2021 (+4.5% per year). Demand comes from Asia, driven by China, and particularly focuses on aerosols for personal hygiene products, cosmetics and cleaning products. On Western European and North American markets, canned foods are being impacted by competition from flexible packaging and by consumers' demand for fresh fruit and vegetables. However, cans for beverages, which represent 65% of the metal packaging market, continue to progress, driven by breweries and micro-breweries which compete with each other on design and special formats. 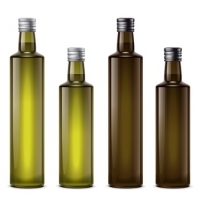 Glass packaging is forecast to record the lowest growth rate by 2020, at USD63.87 billion. Mainly dedicated to drinks and perfume, it has become a symbol of luxury, and sometimes transgression, with high-end and sophisticated creations. Champagne is multiplying its limited series, wines are targeting women with bright colours, beers are using premium packaging with PSL labels for a "label-free'" look. Frosted glass, tactile effects and unique shapes are revitalising this material. 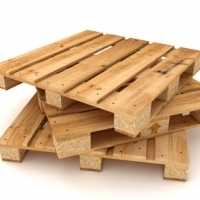 mainly pallets and crates, essentially concerns industrial packaging. Following the growth of the global logistics industry, production of pallets reached 73.6 million Euro pallets (11% increasecompared to 2014), with over 91% of these pallets being made from wood. Canadean estimates the global packaging market at 3,576 billion units in 2015 and 4,029 billion packaging units in 2018 (+12%), while Euromonitor International estimates it at 4,300 billion units in 2015, of which 73% for food and drinks. In view of demand from developing economies, the beauty and hygiene sectors are forecast to record the highest growth by 2019, not forgetting consumer electronics, pet food, household and garden products. The global packaging machinery market is set to record average annual growth of 4.9% in the next three years, to reach an estimated value of 40.3 billion euros in 2018, according to UCIMA. This optimism is substantiated by Technavio, which estimates this global market at USD51 billion in 2020 with a CARG of 5.34%. This growth will be particularly beneficial to packaging machinery for the cosmetics industry (+6.6%), the chemical industry (+5.4%) and food industries (+5.2%). In value, the food market will continue to be the main customer sector, with 31.8% of total demand representing €12.8 billion, followed by drinks with 31.5% for €12.7 billion. Demand for packaging machinery will be particularly strong in Asia, Africa and Oceania (+7.1%) followed by Latin America (+5.6%). Wrapping machines are forecast to have the highest growth rate over the period (+5.6%) due to growth of the flexible packaging market, ahead of filling machines (+5.2%) and labelling machines (+5.0%). Robotics and digital printing are becoming increasingly widespread in packaging workshops and playing their part in a landscape of flexible, reliable machines which are efficient in terms of energy, input and waste, maximising products' shelf-live, with lighter maintenance and enhanced safety. The packaging market in European countries estimated in volume by Canadean should grow by around 2.1% per year between 2014 and 2018, to reach 1,043 billion packaging units. Russia and Germany are the biggest markets. Unsurprisingly, the European packaging market is also taking advantage of flexible materials and rigid plastic with 62% of the packaging market in 2015. 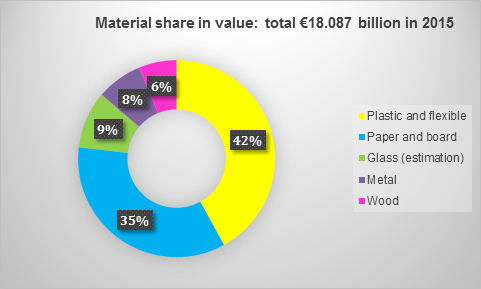 Flexible packaging, forecast at 373.56 billion units in 2018, is essentially represented by bags and sachets (65.8% of demand in 2014), followed by films.The main client sector is food with 80.9% of the market in 2015, where the bakery and cereal segments alone are set to represent 36.9% of demand in 2018. Russia remains the leading consumer with a CARG of 6.28% between 2014 and 2018. European demand for paper and board packaging should continue to grow slowly until 2018 as a result of fluctuations in demand from food products and tobacco. Russia is the highest consumer according to a CARG of 1.97% over the 2014-2018 period, ahead of Turkey and Germany which are other large paperboard markets. 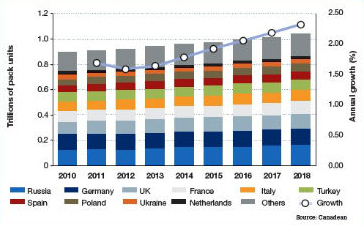 European demand for rigid plastic packaging is forecast to grow to 292.87 billion units in 2018, with sustained growth of 2.19% to 2.61% per year. 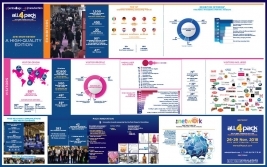 The food sector will use 164.73 billion units or 56.2%, beverages 42.5% and dairy products 24.7%. Germany and Russia are the biggest consumers, each with 13.4% of demand. Germany is forecast to reach 37.68 billion rigid plastic packaging units in 2018 (AAGR: 1,38%). Demand for rigid metal packaging in European countries will record moderate growth of 1.44 to 1.88% between now and 2018. The United Kingdom is the largest consumer, while Bulgaria is set to record the highest CARG, at 12.08% by 2018. Glass packaging is forecast to drop 0.27% as a result of decreasing demand from the food, beer and cider sectors, which currently consume 61.70% of glass packaging in Europe. Beer, the main outlet, is forecast to represent 22.7% of the market in 2018, but like cider and soft drinks, this category is turning to other packaging alternatives. Seasoning products, vinaigrettes and sauces are interesting outlets. 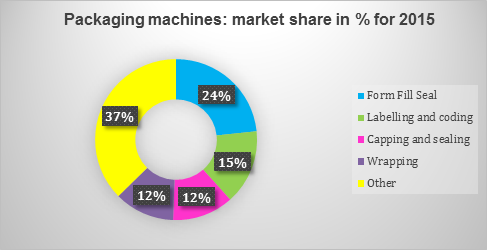 The packaging machinery market in the EU, estimated by Eurostat at €11.6 billion in 2014, is divided between filling/sealing machines (47% at €5.5 billion), washing-cleaning machines (5% at €517.5 million), and outer packaging machinery (48% at €5.6 billion). The two leading European countries in terms of production, Germany and Italy, are neck and neck. Machinery production stagnated in Germany from 2012 to 2014, and that of packaging machinery declined by 7.5%. In Italy, this production reached 6.1 billion euros in 2014 and recorded growth of 1.4% in 2015. Both countries also have the same export rate, at nearly 86%, particularly to Saudi Arabia, Nigeria, Peru, Indonesia, Malaysia, Algeria, Turkey and Iran. The market should continue to grow 3% in the next three years to reach a total of 10.7 billion euros according to UCIMA, driven especially by machines for the cosmetics industry (+4.8%), the food industry (+4.1%) and the chemical industry (+3.5%). In 2014, the French plastic and flexible packaging industry posted turnover of €7.6 billion, compared to €7.5 billion in 2013, representing growth of 1.3%. This sector has 400 businesses and 38,000 employees, dedicates 4.5% of its turnover to investment (compared to 4% in 2013) and produced 2,039 KT in 2013. 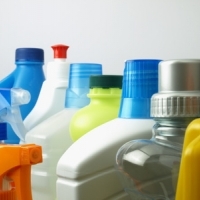 Client sectors for packaging and plastic film are firstly food (65% of turnover), followed by health-hygiene and beauty (12%), household cleaning products (13%) and lastly, industry and transport for 10%. 2015 was marked by a fear of a shortfall of raw materials, which led to supply problems and price increases of certain polymers which were difficult to control. In 2014, the paper and boardpackaging branch, which has around 700 businesses, generated consolidated turnover of €8.3 billion (identical in 2013 and 2015), of which €2 billion in production with 34 businesses and 4,300 employees. Transformation, in other words the French paper and boardpackaging industry, generated consolidated turnover of €6.3 billion for 5.1 million consolidated tonnes from over 650 businesses and 30,000 employees. This industry groups production and transformation of packaging in corrugated board, folding board and coated/multilayers paper, 80% of which accounts for transport packaging, with the remaining 20% being household packaging, for food in 55%of cases. (-0.3% compared to 2014). Tonnages produced were 2,700 KT in 2014 (-0.40%) and 2.840 KT in 2015 (+0.8%). The boom in e-commerce in 2014 did not make up for the reduction in orders in the food and manufacturing industries. Ranked third in Europe and sixth in the world, France has a negative balance of trade. Nearly 90% of the 353 KT imported in 2015 (-0.9% compared to 2014) is from Europe, and in particular Germany, Italy, Spain and Belgium, while 225 KT are exported (+3.9%compared to 2014). The foldingcardboard sector remained stable in 2014, with a variation of +0.5% in value and +0% in tonnage. The situation was practically identical in 2015: +0.5% in value and +1% in tonnage with 603 KT transformed. In 2015, the sector observed a slight upturn in operating margins. Food is the dominant customer market with 56%. It is ahead of consumer goods (24%), intermediary goods (12%) and capital goods (6%). In 2015, production of paper packagingfell in tonnage by 1.4%, as did the production of industrial and commercial paper bags (-6.3%) due to a reduction in construction and building markets, while small and medium bags started to see the effects of the ban on non-biodegradeable bags, which came into force on 1st July 2016. The French glass packagingindustry is third in Europe with 3.1 million tonnes in 2014 from 20 units and around 6,800 employees. It contributes 14% of EU production, behind Germany (18%) and Italy (17%). The 2.2% growth in tonnage compared to 2013 is greater than the average growth recorded by the European glass-making industry in the period. This pick-up follows a decline of 3% per year on average since the start of the economic crisis. Production is driven by bottle-making, which benefited from the good performance of the beverages and wine sector in 2014. 2015 was marked by the Saint Gobain group's sale of Verallia, number 3 in the world in glass packaging, to the Apollo pension fund and to BPI France. The 40 units and 6,500 employees which make up the French metal packaging industry generated turnover of €1,364 million in 2014, a 3.5% increase compared to 2013. Steel packaging represented €839 million in 2014 (+0.6% compared to 2013), aluminium reached €525 million (+8.5% compared to the previous year). In volume, progress of tinplate packaging is slightly above that of aluminium: respectively +2.6% at 399 KT in 2014 and +2.1% at 297 KT. 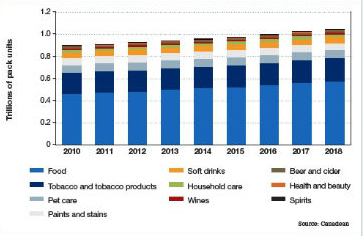 With growth of 9.9%, two and a half times greater than European market growth, 5.15 billion of cans for beverages were filled in France in 2014. 33% of these cans were beer cans, which represented just 19% in 2009. Canned food also made a 5% increase to 279,000 tonnes, of which 231 KT for steel (+5.2% compared to 2013) and 47.8 KT for aluminium (+3.9%). However, aerosols and metal industrial packaging combined decreased by 2% to 64.7 KT in 2014, although the aerosol sector was slightly up. Lastly, metal capsules recorded a considerable decrease of 8.2% to 63 KT. 2015 was a year that highlighted the French Act 2012-1442 pertaining to "the suspension of the manufacture, import, export and marketing of all food packaging containing bisphenol A". Keep watching for any subsequent consequences in terms of specific migration limit! The wooden packaging industry consists of four business sectors: pallet production with 450 companies and turnover of €450 million, industrial packaging with 133 companies and turnover of €373 million, light wooden packaging with 45 companies and turnover of €300 million. These three sectors generated combined turnover of around €1.123 million in 2014. In 2015, lightweightwoodenpackaging recorded a drop of 1.7%, while crates and industrial packaging grew by 1.1%. Although purchase and sales prices remained stable in 2015, margins collapsed with turnover down by 0.7%. The fourth sector, that of barrel-making, produced 524,500 barrels with turnover of €342 million with 51 barrel-makers, which represents stability in value with a slight decrease in volume of 3%.Barrel-making, which exports 70% of its production, has enjoyed a period without any major economic issues since 2000. Only 10 companies in this global wooden packaging industry have more than 100 employees, one of which is the European leader in pallet-making.Therefore, 18,000 employees generated turnover of around €1.5 billion in 2014. In 2014, the French packaging and filling machinery industry generated turnover of 670 million euros with 138 production units and a workforce of 4,217 people. In 2013 it recorded a slight decline of 0.3% to €672 million. Exports totalled €405 million, i.e. a fall of 8.6% compared to 2013 to €443 million. Destinations are the USA with 17% in value, Spain with 7%, China with 6%, Russia, Germany and the United Kingdom with 5% each. But 46% of these exports are for other African and North African countries, for example. Imports, which amounted to €427 million compared to 456 million in 2013 (i.e. a fall of 6.4%) come mainly from Italy (36%), Germany (28%), the Netherlands and Switzerland for 6% each in value. 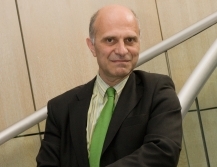 In 2014, machines for packaging transformation and manufacturing machines, equipment to identify, mark, decorate or label, palletizing systems, protection systems for storage and shipping benefited from the recovery of the American market and developments in Asia, but geopolitical disruptions delayed or put a burden on investment projects in Russia and in the Mediterranean Middle East. "Millennials", "digital natives", "generation Y” and even WE-I generation": there are nearly 16 millions young people in France who were born between 1980 and 2000 (a quarter of today's population and half of the active population by 2020), 80 millions in the USA and 364 millions in China. This generation, the biggest since the baby-boom, is the first to have grown up with the Internet, to have only experienced economic hard times, and to live at the pace of technology. A spirit of adventure in reaction to "digiphrenia" (information overload): slow down time and events, digital detox, create "happy networking": symbols of simplicity and solidarity. "Experience takes precedence" and, steeped in "more with less", Millennials are inventing a new form of hedonism consisting of shared conviviality, a quest for feeling better and self-liberation. They are paving the way towards the packaging of the future: resolutely more (ultra smart) with less (eco-designed).